SIERRA VISTA – Beatty’s Guest Ranch once had a lush apple orchard that provided fruit to sell as well as a home for the many hummingbirds that call the Huachuca Mountains home. Today, most of those trees are gone along with the green in the surrounding landscape, and much of the property is covered with landslide debris. 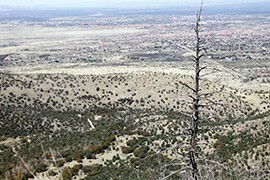 The damage is left over from the 2011 Monument Fire, which devastated about 38,000 acres and destroyed or damaged dozens of structures in the Huachucas and on the fringes of Sierra Vista. Nearly four years later, the Beattys and others here continue to deal with its aftermath and use lessons learned in hopes of preventing or minimizing damage from wildfires. Beatty’s Guest Ranch, which offers cabins frequented by photographers and those taking to take in the serene views, survived the fire without damage to structures. But it didn’t escape subsequent floods and landslides that filled one cabin 5 feet deep with gravel and severely damaged its interior in addition to severely damaging the apple orchard. On a recent weekday, Tom Beatty Jr., who manages the ranch, was out with a tractor, working to get the landscape back to the way it was. Some trees that survived the fire were carefully planted with enough space between them. 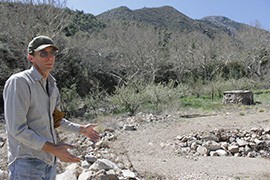 That probably saved the ranch from even further damage and allowed Beatty and his father to defend their property. Despite the damage, the ranch remains relatively intact, and the precautions taken by the Beattys to prepare for fires mirror what area fire officials hope to achieve around the community. 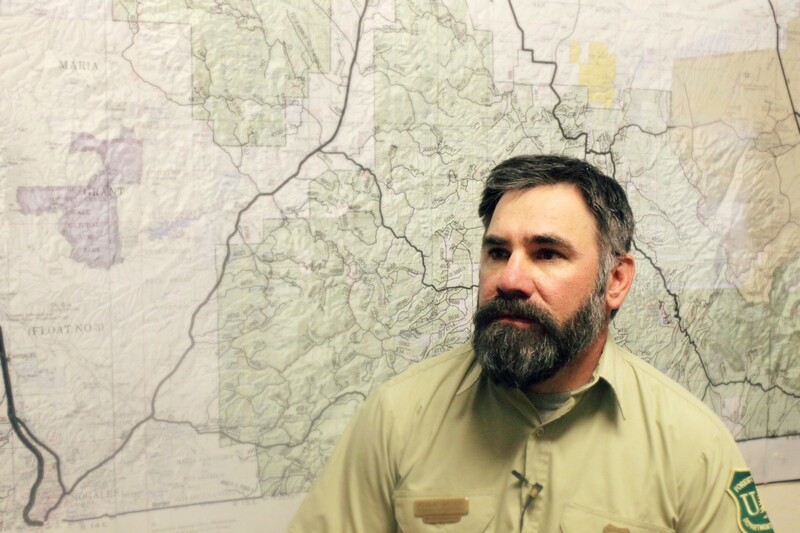 Kendal Wilson, fire management officer for the Sierra Vista Ranger District, said the most important takeaways from the Monument Fire were the need for education and for collaboration among agencies and neighbors. Wilson and other officials, like Paul Cimino, fire marshal for the city of Sierra Vista, are working on keeping disasters like this from happening again as the city heads into wildfire season with dry conditions. Cimino said that the disaster left this community stronger and wiser, though, by making people more conscious of the dangers associated with wildfires. Cimino said that when a wildfire starts, within minutes, even seconds, it can change. Many people, he said, still have many possessions packed up from the Monument Fire. “They’re saying, ‘These are things we normally would put on a wall, but in the event something should happen, we have them still packed so we can get out quick,’” he said. As the town heads into wildfire season, Cimino said he hopes it will be another year of improvement. 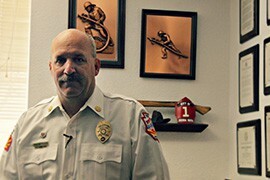 He said his department is putting a stop to residential open-burning and even putting a restriction on fireworks use. They are also advocating for safetyand preparedness, especially in areas at the edge of town. At Beatty’s Guest Ranch, the hummingbird numbers remain low, but a bloom among surviving apple trees means hope for the little creatures, and for the ranch itself. 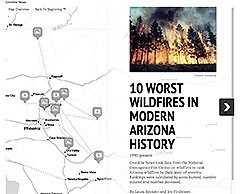 The 2011 Monument Fire blackened tens of thousands of acres and destroyed dozens of structures around the southeastern Arizona community of Sierra Vista. With wildfire season at hand, local officials say they're applying lessons learned from that disaster. 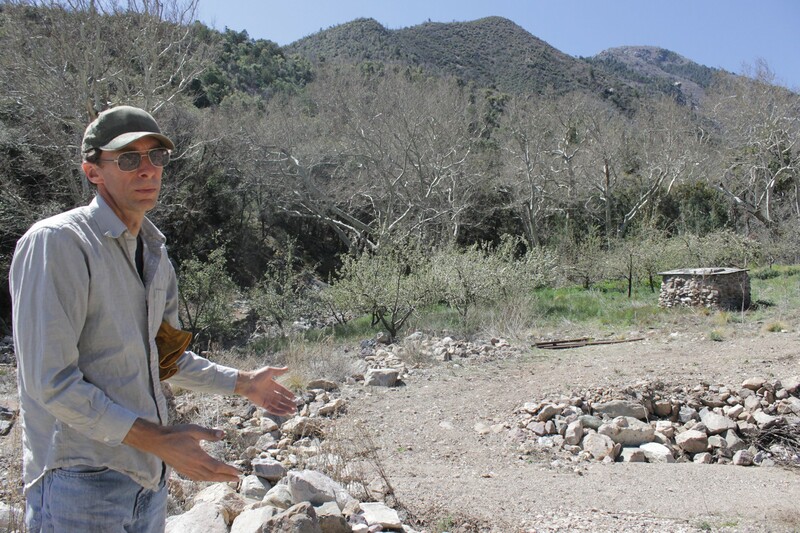 At Beatty’s Guest Ranch outside Sierra Vista, Tom Beatty Jr. shows areas damaged by the fire and the floods and landslides that followed. 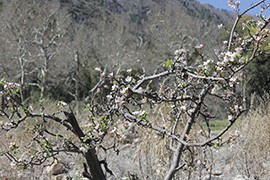 An apple tree that survived the 2011 Monument Fire and the floods and landslides that followed blooms at Beatty’s Guest Ranch outside Sierra Vista. 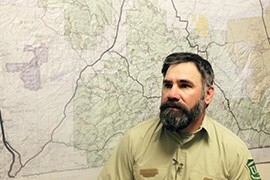 Paul Cimino, fire marshal for the city of Sierra Vista, says the 2011 Monument Fire, which destroyed dozens of structures, left the community stronger and wiser by making people more conscious of the dangers. 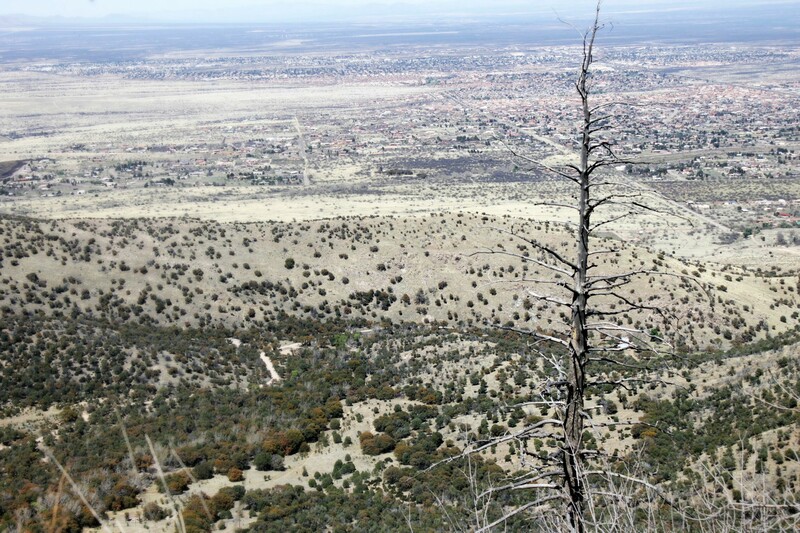 A tree burned by the 2011 Monument Fire overlooks Sierra Vista from the Huachuca Mountains.